GeoStream UK is part of the McAuliffe Group , the brownfield expert established over 45 years ago. McAuliffe is one of the leading environmental contractors in the UK, with a turnover in excess of £14m. As part of McAuliffe’s philosophy to deliver all its services using its own in-house resources, McAuliffe entered into a formal and exclusive relationship with GeoStream Srl to provide process technologies in the UK and Ireland in 2011. GeoStream Srl, like McAuliffe, is a successful family business with similar values and a commitment to excellence with offices in Italy, Spain and Brazil. GeoStream UK has strengthened its in-house offering by becoming the only single source provider of tried and tested remediation technologies in the UK, being the exclusive provider of Trap & Treat® (BOS 100® & BOS 200®) and the full range of injectable substrates supplied by Carus Remediation Technologies for the UK and Ireland. With a team of 48 specialists, and significant plant assets and technologies, GeoStream UK is now the only UK contractor able to fully design, build and deliver a bespoke cost effective remediation solution for every site. It does this by selecting the appropriate combination of process plant and/or chemical technologies, as well as delivering any associated physical ex-situ remediation and enabling works. James has over 25 years’ experience in contaminated groundwater and soil remediation, is a Chartered Environmental Engineer and has worked on a wide variety of in-situ and ex-situ projects. Having a background in the oil and gas sector, James has worked in many safety critical environments in the UK and overseas. Key projects include the UK’s largest SVE system, bioremediation of over 250,000t of soil, thermal treatment of soils and multiple groundwater treatment systems. Over the past seven years James has fulfilled the MD role for specialist Design and Build Environmental Contractors. Richard has over twenty years’ experience in the contaminated land industry. Richard has a BSc in Environmental Science and also holds the highest level WAMITAB, allowing management of hazardous sites. Richard has a wealth of experience in the remediation of contaminated sites, including work for the National Grid Property Holdings Framework Contract and remediation of the 2012 Olympic Park site. More recently Richard held a senior executive position in the process engineering sector of soil and groundwater remediation, and has strong expertise in technologies including high vacuum extraction, soil vapour extraction, multi-phase extraction, pump and treat, and free product recovery. Olivia is a renowned specialist in the field of in-situ remediation technologies, and is driving an advanced technical strategy for GeoStream UK, leading the promotion, development and supply of in-situ remediation solutions within the UK market. Her wide ranging experience includes involvement in the design and support of more than 1,800 successful soil and groundwater remediation projects, as well as lecturing in her subject area at an academic and professional level. David brings over thirty years of engineering experience to the GeoStream team, having extensive hands-on technical and managerial experience in the groundwater and soil remediation sector. David has many years of experience as company director for organisations all over the world. Robert is a specialist remediation engineer, holding a BSc and MSc from the University of Manchester. He supports Managing Director James Cartwright in delivery of timely, efficient and effective on-site remediation. Lucy focuses on marketing strategy, client relationship management and communications for GeoStream UK. Previously Executive Assistant at a number of high-profile companies across the North, Lucy provides support to John McAuliffe and the wider team. With over 20 years’ experience in technical, geophysical and geological engineering, Roberto provides technical guidance on remediation to the UK team. Roberto holds a number of professional qualifications in both remediation technology and project management, building on his degrees in geological sciences and environmental management. Vito leads on health and safety, responsible for the issuing of technical manuals and safety documents and preparation of the P and iDs. 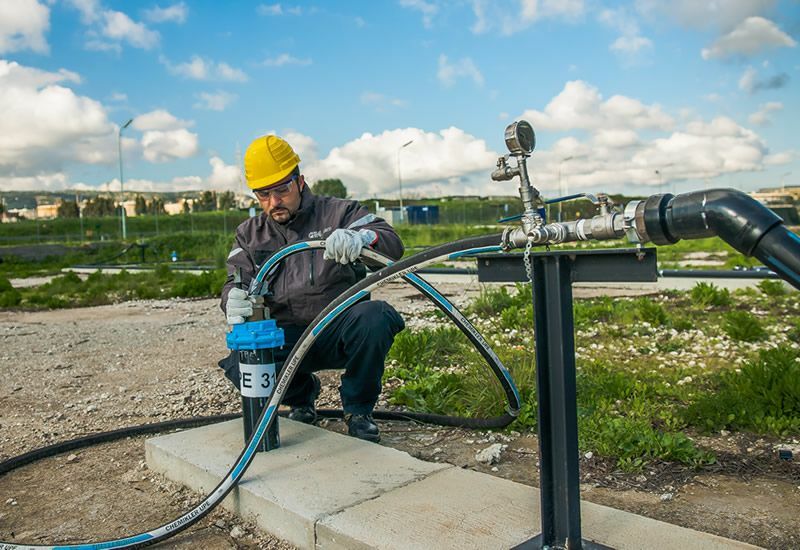 GeoStream provides highly specialised, efficient and effective solutions and technologies for the remediation of contaminated soils and groundwater. GeoStream has a wide-ranging portfolio of the very latest mechanical, process-based and injectable substrate technologies. GeoStream is the only UK contractor with the complete package of in-house remedial solutions. This includes its own commercial manufacturing facility of process equipment. Want to ask GeoStream UK a question? Fill out the small form below and we will get back to you as quickly as possible. I consent to having GeoStream UK collect my name and email.